All of my UFO photos from Jefferson City were taken during the night time hours. Some of these ships were several hundred yards away. Most of these photos were taken with only available lighting and very few used the small camera flash. 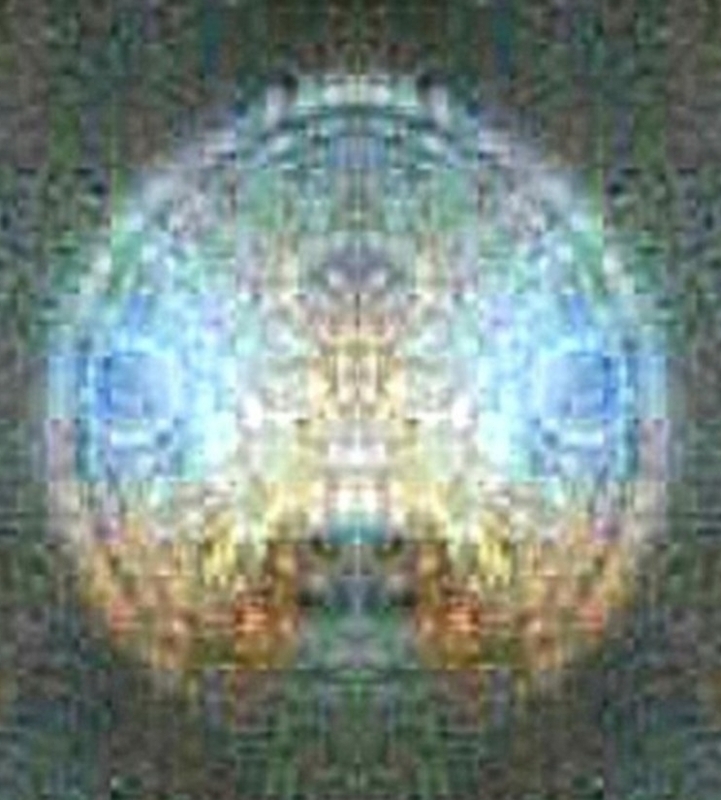 It was sometime necessary to use computer enhancement such as brightening the image or equalization to bring the image of the ship out of the darkness of the night. Due to the distances involved some of these photos have been subjected to massive enlargement which has a tendency to cause some blurring. The image on the front page (the freighter <?>) was (almost two hundred yards from the camera.) found in a totally dark area of the photo with only the two brightest parts barely showing in the darkness of the photo. Computer equalization was used to help reveal the ship. The bottom of the ship is still cloaked to some extent but some detail of the shape is visible. It appears to me that the top section of the ship (the Power Rings - is probably circular in shape and probably contains the power plant) seems to be raised above the ship body at the front and joined closer at the rear. This indicates the capability to raise the front of the power plant (circular disk / rings?) away from the body of the ship. This could simplify replacement of the power plant or the body structure. In the photo below it appears that the front of the ship has a long (neck) tubular projection on each side of the front with a cockpit pod at the outer end of the tube projection. 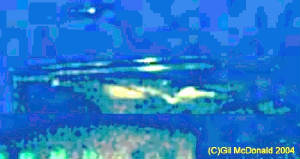 This indicates the bottom sections of this ship may have the shape of the sailing catamaran craft, allowing for two large ship bodies (one on each side) with a mostly raised and open section, or possibly a smaller ship body (or cargo pod) in the middle. This would allow an empty middle section of this craft to capture other ships (such as our space shuttle, small aircraft or ships) or small asteroids in that center section. Has anyone ever considered the possibility that our "International Space Station" may be up there with the primary mission to observe and attempt communication with these creatures? A video camera on the ground has such a limited field of view but from the "International Space Station" a camera could see half of the Earth and could film these ships coming and going. It must look like space rain bombarding the earth. It seems that Earth's Governments have NO CONTROL OVER THIS SITUATION. I also want to point out the arm on this freighter ship that seems to originate in the upper back section of the ship body and end with the pod that extends it close to the front of the ship. This arm and pod could be used as a hand or claw to gather or dispurse large items to or from the ship, much as we use the arm on our space shuttle or there is the lesser probability that it might be a part of the power plant. The orgin of this arm and pod seems to be near the rear center of the ship between the power plant rings and the upper body of the ship. There is also an indication of a circular opening in this area near the center and just below the power rings. This opening would probably assist in the connection of the power rings to the ship body when the rings are lowered and also, probably, contains a vacant area where the arm and pod can curl up for storage during inter-stellar / inter-dimensional travel. This ship appears to have a fan type apparatus at the far rear (bottom left in the photo below) end that might be used in a seeding operation to dispurse seed (such as orbs) or vapor all over the planet, or for underwater movement, or there is the vague posibility that it is also a part of the power system. Whatever it is for, this apparatus would probably fold into the ship during travel. The fan blade section would fold up to fit into the very rear of the ship and then the section sticking straight back from the ship would fold downward bringing the entire apparatus up to a position that is snug to the rear of the ship. There is the possibility that cargo doors could then enclose that section of the ship. I know the size of the building this ship is hovering near. The official designation for this building is Housing Unit #3. This is one of the buldings made from huge lime stones and used as an inmates housing unit. The prison was emptied and decommisoned in 2005. The building in the center of the photo is HU#4 and the building on the far right of the photo is HU#5. It appears that this ship could be around 70 yards in total length. The ship is about 80' above the ground. This photo contains a couple of other objects in addition to the four (or more) bright light objects (?). The object on the right side of the photo (next to the bright light objects) is probably a seperate part of the freighter that detaches for docking purposes and would re-attach to the front of the freighter prior to departure. It is obvious that there are a couple of deep notches in this part and these could slide over the forward edge of the power rings. There is also the posibility that this part is malable and able to change shape depending on its use. This object seems to have an almost invisible tube (passageway and / or anchoring rope / energy force?) connected to it from each side of the Freighter ship. The very presence of this type of ship almost at ground level is a positive indicator that they are not visiting or just observing but they are building permanent bases. The four or five lights on the right that are stacked on top of each other are most likely attached to their building framework that rises above housing unit #5. Although that framework is hard to see I have posted a couple of photos on this site that show the framework above H.U.#5. This photo was taken about 11 PM of an area of sky above the Missouri River @ Jefferson City. The small camera flash, though ineffective, was used for this photo. The flash may have added some of the coloration to the bottom of the UFO. I call this type of ship an 'Alien Cruiser'. Only the left half of this ship was found in the top edge of the photo. Computer programing was used to create a mirror image right half and put the two halves together (and rotate this perspective 90% to the right) to give a fairly accurate representation of what this particular ship might look like from this angle. There may be a narrow strip missing in the center of the ship. I have a photo on page 12 which shows another ship of this type and it does appear to be more round. I also have captured a video image of a ship of this type leaving the area close to the Missouri State Capitol. It is always a good feeling when I can capture the video image of a ship type that matches up to my photos as it helps to verify their existence and movement capabilities. Close study of an enlargment shows some type of projections at certain locations on the ship. These projections could be weapons or antennas, etc. This image shows that the atmosphere outside the front and rear of the ship appears differently in the photo, indicating a capability to manipulate the atmosphere, possibily forming a displacement field to protect the ship and enhance their movement capability..
On one occasion I actually saw one of these ship types hovering over ground buildings. I only saw it for a few seconds before it went back into the cloaking mode. Knowing the size of the buildings this ship was hovering over, I estimate this ship to be 50 or 60 yards in width. The ship I saw hovering had five light projection tubes going to the ground areas below the ship. Four of these were round (circular) blue light tubes about three feet or more in diameter and some passed through the buildings below and seemed to go on into the ground. They seemed to have creatures in the tubes and they were moving as if in an elevator. These four blue light circular tubes were evenly spaced as if each one was at the corner of a four cornered square. The fifth blue light tube was from the center of the ship and into the ground. This tube was shaped like an hour glass (or described as: two ice cream cones with the upper light cone having the large end against (or into) the center bottom of the ship and the smaller end being at the center of the downward light projection where it met with the smaller end of a second light cone below it and that second light cone having the large end against or into the ground.) Most of this blue light cone was covered by a swirling black powdery matter that covered most of the outside of the light cone and (the black matter) slowly rotated around the outside surface of the blue light cone in a counter clockwise movement. In the photo of the ship on this page the engine compartment is to the rear. The discoloration in that section is from the tremendous heat produced by the power plant. This rear section of the ship also has a moveable section that I call the 'Heat Vent Shields'. When these heat vent shields are retracted the heat vents would have better cooling capabilities and the normally circular shape of the ship will have a flattened appearance in that area. The aliens / demons have ships that are a lot smaller than the cruiser and the freighter. Even the shuttle craft is only a fraction of the size of these two larger ships. A valid reason for the larger ships would perhaps be weapons and to accomplish more in one trip than can be done with the shuttle craft and / or its transporter. More proof that the old prison was their base of operations. WHY WOULD the ALIENS CHOOSE a PRISON for a BASE of OPERATIONS?? I have been ask this question several times. Especially an old prison like that one. It makes sense to me. If you were an alien / demon that can look like a ghost wouldn't it make perfect sense to make a base of operations in an area where people were executed and where murderers lived and were still trying to kill people. If your ships can be cloaked but might occasionaly become visible briefly, an 160 year old stone wall and stone buildings make a great place. Also all activites, inhabitants, traffic and even the trains are limited by specific schedules, etc. The river has always been a valuable resource for these creatures. They are not afraid of water. I have seen them in the river playing like dolphins. Every night they would run miles and miles of (what appeared to be) large pipes all over the prison area and many of them were carrying water or some other element to or from the river. Before daylight the pipes seemed to be gone. Also, the prison had about 200 or more workers, about 1000 inmates and dozens of trucks and cars coming and going each day. If the alien/demons wanted to ship anything out by car or to some homes or by train, this was an almost perfect location. And the UFO traffic was not only at this one spot on the river. They used the area for at least a half mile on each side of the prison. Several blocks away from the prison is the State Capitol and my video shows many UFOs trafficking in that area. I have seen a lot of evidence that most of their work is done underground and / or in the buildings but I have been in very few buildings and seen nothing in their well lighted areas and other than the buildings underground I have never seen any underground areas although I have heard that there have always been many underground tunnels in the area that were build for use by the prison system.